The Washington Nationals continue to struggle in MLB. Washington fell to the Pittsburgh Pirates 6-3 on Monday at PNC Park. The Nationals have now lost 10 of their last 14 games and are in third place of the National League (NL) East standings with a 45-45 record. Pittsburgh scored three runs in the first inning to take an early lead. The Nationals answered with a run in the second before the Pirates pulled away in the bottom of the frame on an RBI triple by Corey Dickerson and a two-run homer from Gregory Polanco. 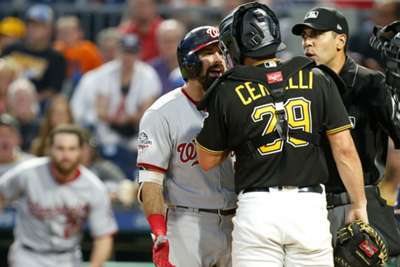 The teams' benches briefly cleared in the sixth inning after Pirates catcher Francisco Cervelli and Nationals outfielder Adam Eaton exchanged words at home plate. Polanco finished the game with two hits and four RBIs. Eaton tallied three hits and Bryce Harper blasted his 22nd home run of the season for the Nationals in the losing effort. Scott Schebler tallied four hits and three RBIs in the Reds' 7-5 win over the Indians. Aaron Nola threw seven shut-out innings and allowed just one hit in Philadelphia's 3-1 win over the Mets in game two of their doubleheader. Rangers reliever Jesse Chavez allowed three runs and three hits in his one inning. Texas fell to the Red Sox 5-0. Rays reliever Jaime Schultz surrendered three runs and failed to record an out in his team's 10-9 win over the Tigers. Wilmer Flores belted a home run off the left-field foul pole to give the Mets a walk-off, extra-inning win over the Phillies in game one of their doubleheader. New York and Baltimore continue their four-game series after splitting a doubleheader Monday. Masahiro Tanaka is set to return from the disabled list and take the mound for the Yankees while Andrew Cashner will start for the Orioles. New York have reportedly expressed interest in trading for Baltimore star Manny Machado.